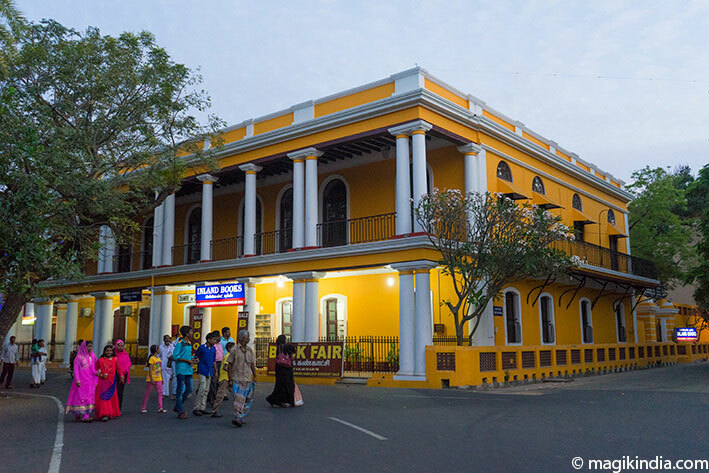 The town of Pondicherry, now renamed Puducherry, was formerly a French trading post. 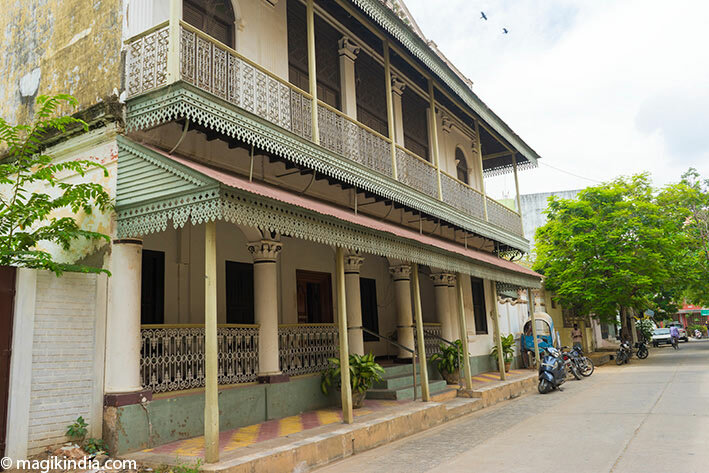 Its well-ordered streets lined with trees and bougainvilleas, painted colonial buildings and chic boutiques, together with its spiritual aura, make it one of the most relaxing places to stop on the Chennai-Madurai road. 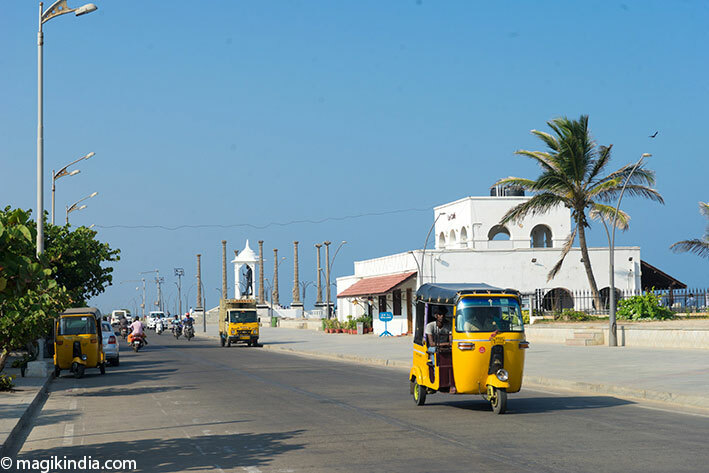 The state of Puducherry comprises four separate coastal enclaves called Puducherry, Karaikal, Mahé and Yanam. Puducherry and Karikal are on the east coast of Tamil Nadu, Yanam is in Andhra Pradesh and Mahé is on the west coast, in Kerala. Puducherry town is the state’s capital. It lies on the coast about 162km south of Chennai (Madras). The name Pondichéry was a French corruption of the original name Puducheri, which means ‘new colony’. Tamil is the main language spoken in Puducherry but many people speak either Telugu, Malayalam, English or French. The town was built on a grid plan from the start. It is split in two parts, the French quarter and the Tamil quarter. On the north side there are several beaches and the iconic Auroville, an experimental town built as a place for living in universal community and peace. The French part of the town was built along the seafront. 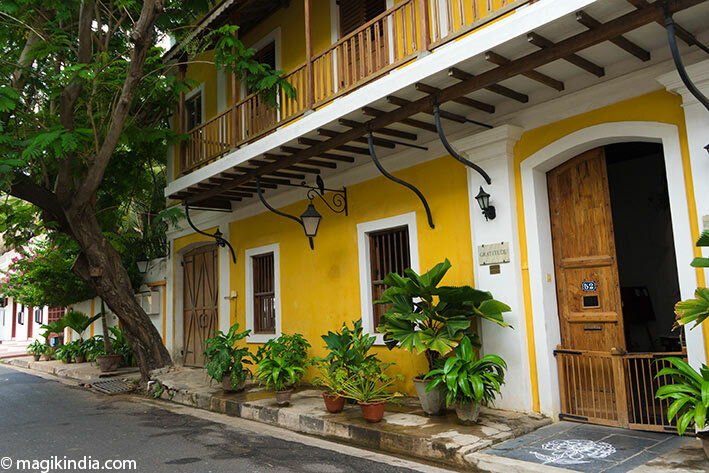 Its wide streets are punctuated with colonial buildings with a colonnaded front some dating back to the 18th century. Most now house government institutions. The residential buildings have an inner courtyard with garden and most of them house bijou hotels, restaurants, art cafés and chic shops. The famous Sri Aurobindo Ashram and the Ganesha temple are in the French quarter. The Tamil quarter is very different from the French one, more popular and more animated, this is here the ‘real’ India you meet. The buildings have a typical Tamil architecture: the entrance has a colonnade porch or ‘Thinnai’ in the Tamil language. This porch shows the wealth of the family. The more elaborate the Thinnai is, the wealther the family is. 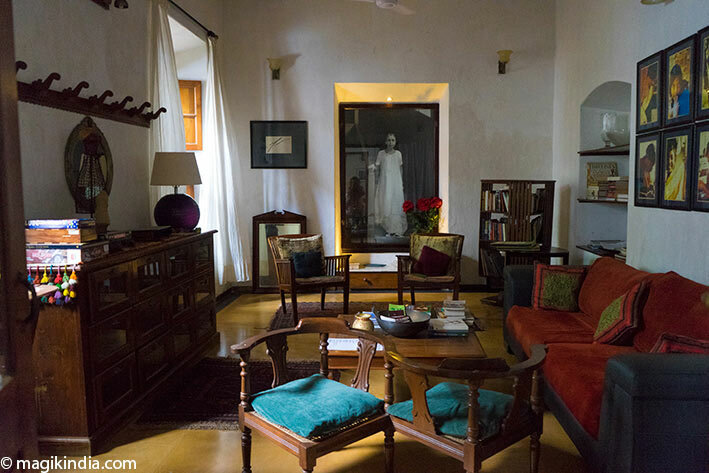 After the porch, we enter the main living room often equipped with a large wooden swing (oonjal). Then we cross the ‘Mutram’, a unique feature of tamil houses. The Mutram is an open space with a pluvarium that allows the circulation of air and brings natural light into the house. The kitchen is located after crossing the Mutram. Finally, you arrive in a backyard that serves as a garden. There is often a ‘Thulasi Maadam’, a tulsi (basil) in a high pot. Tulsi is a plant considered sacred in Hinduism and used as a medicinal plant. The promenade, Avenue Goubert, is Pudicherry’s best-known spot, much frequented by joggers. It is closed to traffic in the evening; then it seems as if the whole of ‘Pondy’ has come down to enjoy the sea breeze. One feature along the promenade is the Gandhi Mandappam or Gandhi memorial. 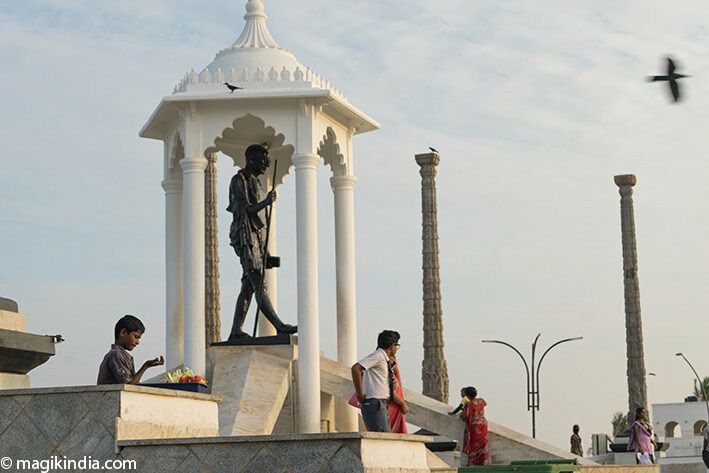 The statue, at four metres tall the tallest statue of Mahatma Gandhi in Asia, is surrounded by eight granite pillars that were brought from Gingee, a fort 70km from Puducherry. By way of anecdote: an underground tunnel leads from beneath the Gandhi statue to Gingee Fort. The government had started to dig out the sand that silted up the tunnel, but abandoned the project after several people suffocated inside it. It was closed once and for all in the 1960s. The Sri Aurobindo Ashram in Rue de la Marine, in the French quarter, is Puducherry’s most emblematic place. It is one of India’s most famous Ashrams, with devotees coming from all over the world. 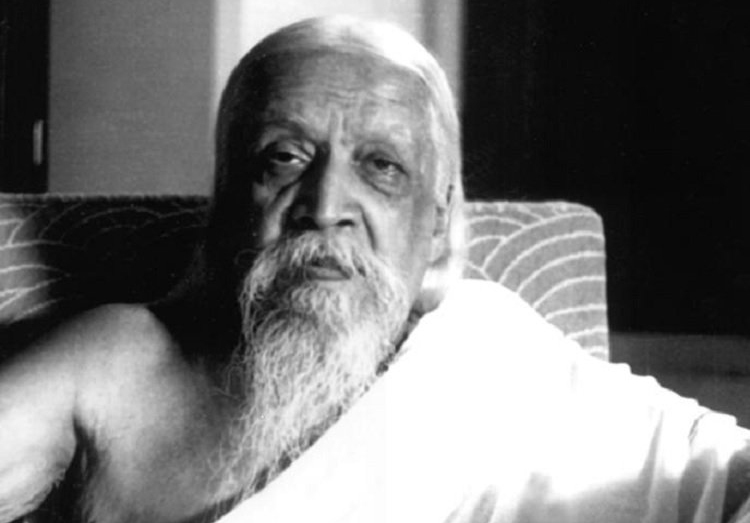 The Ashram was founded by Aurobindo Ghosh (Sri Aurobindo), a poet, philosopher and activist for India’s independence. He was imprisoned by the British for writing articles against British rule. While in prison, he had mystical and spiritual experiences. On leaving prison he moved to Pondicherry and abandoned politics for the spiritual life. In Pondicherry Aurobindo discovered the power of yoga and developed a method of spiritual practice he called Integral Yoga. In 1926 he founded the Sri Aurobindo Ashram with the help of his spiritual partner Mirri Alfassa, a Parisian mystic known as the Mother. He died in Pondicherry on 5 December 1950. 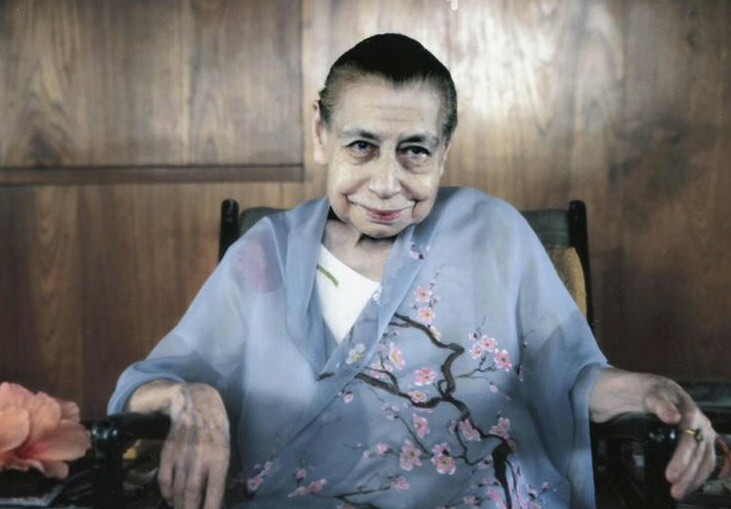 After the death of Sri Aurobindo in 1950, the running of the Ashram was entrusted to the Mother. 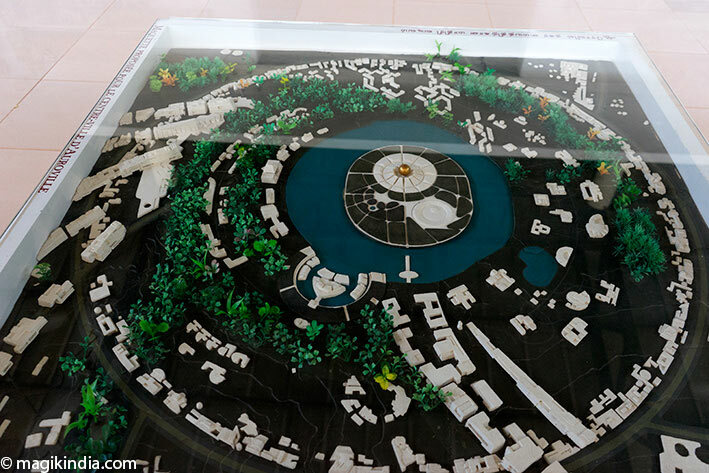 It was she who dreamed up the idea of Auroville, the ‘city of dawn’. She died in 1973 at the age of 93. 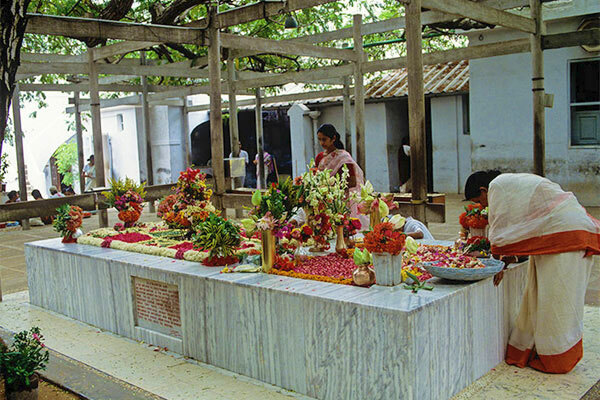 The mortal remains of Sri Aurobindo and the Mother are entombed in a samadhi or shrine under a frangipani tree in the Ashram’s central courtyard. Each day devotees cover it with flowers. 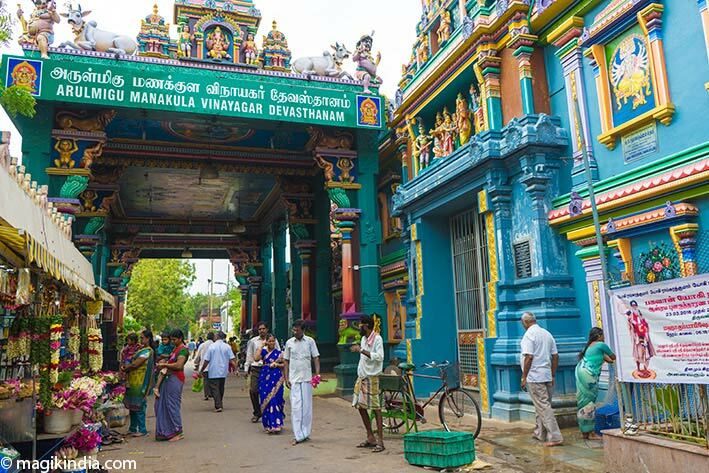 Manakula Vinayagar is one of Pondy’s largest temples. It was built three centuries ago, in the Dravidian style. The temple is dedicated to the elephant-headed deity Lord Ganesha. The interior is decorated with 40 forms of Ganesha carved into the stone walls. There is also a shrine to Ganesha’s brother Murugan. The Goubert Market is Puducherry’s largest covered market, encompassing several streets. 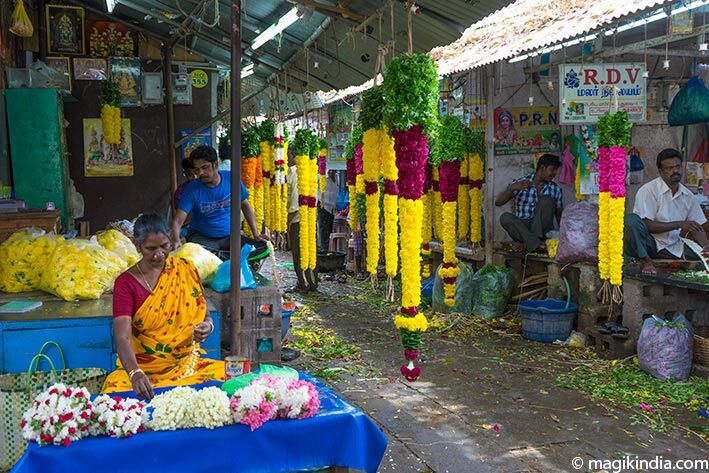 The flower market is especially worth a visit for its feast of scents and colours. Locals come to buy flowers and garlands for religious rituals and weddings. The church of Our Lady of the Angels, on the old Place des Capucins surrounded by Rue Dumas, Rue Surcouf and Rue Romain Rolland, looks out to the promenade and the Bay of Bengal. Between the church and the sea is a small garden, in the centre of which stands a statue of Joan of Arc with battle standard. The church is said to have been built by the engineer Louis Guerre, whose family had been based in Pondicherry since the eighteenth century. Bharati Park in the French quarter is a lovely place for an idle stroll or for seeking refuge from the summer sun. In the centre of the park is the Aayi Mandapam, a monument built to the memory of Aayi, a prostitute who sacrificed her house to dig a well for the villagers in the area. Its style is Greco-Roman. 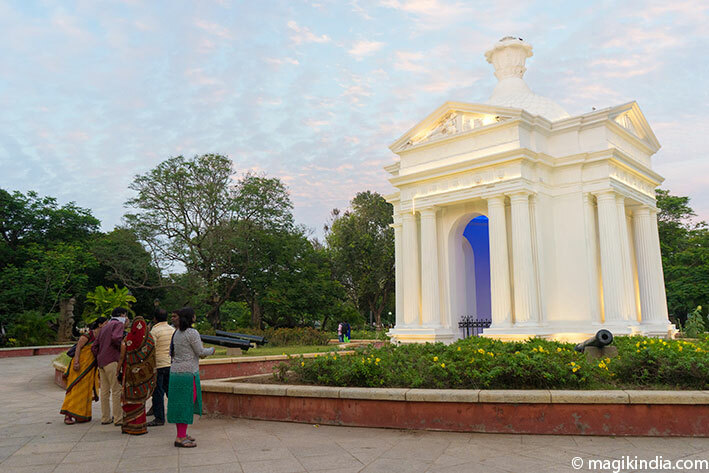 Around the park there are several government buildings including the Raj Niwas, residence of the governor of Puducherry and once the palace of his French predecessors. 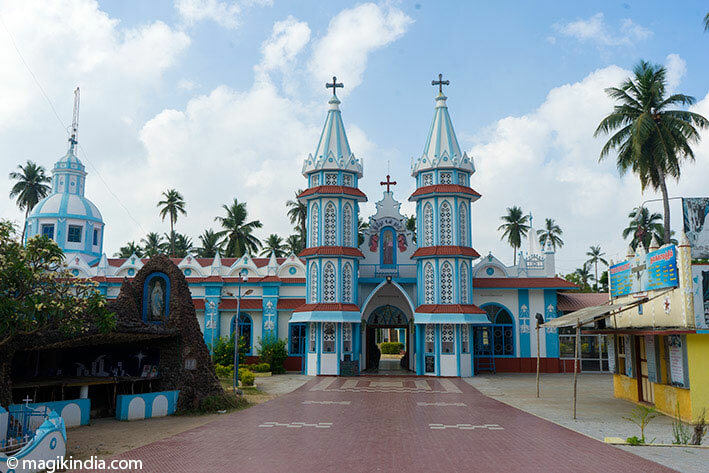 The Church of Our Lady of Health is in Ariyankuppam, a village 4km south of Puducherry. 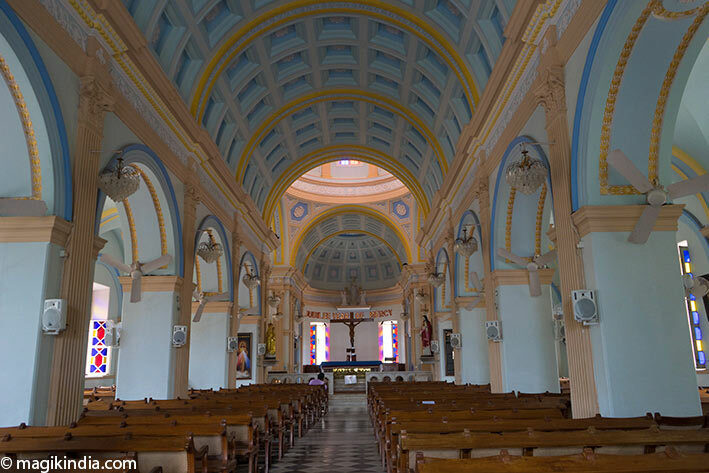 After the arrival of the French in Pondicherry in 1673, Armenians under the direction of Cardinal Adda Simon built the church to Our Lady of the Conception in 1690. It was given to the Jesuits of the Carnatic Mission in about 1700 and was renamed Eglise de Notre-Dame de la Santé: Church of Our Lady of Health. It is a popular place of pilgrimage for the people of Puducherry. Chunnambar is 8km from Puducherry on Cuddalore Main Road. 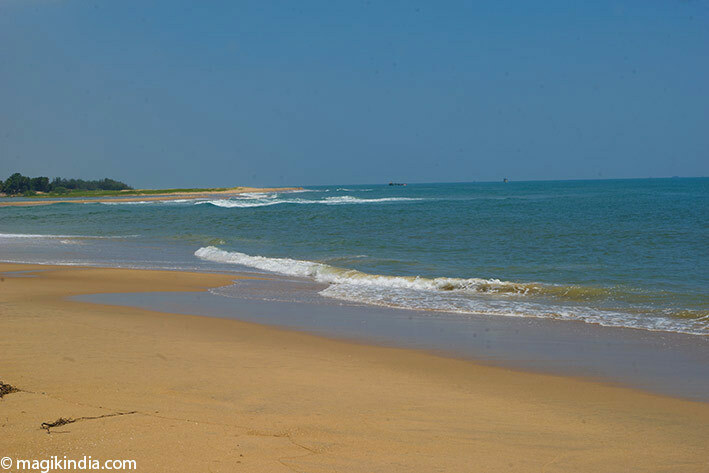 Chunnambar Beach, also known as Plage Paradiso or Paradise Beach, is near the mouth of the backwaters. It is well named: it is clean, the sand is fine and there are few people. 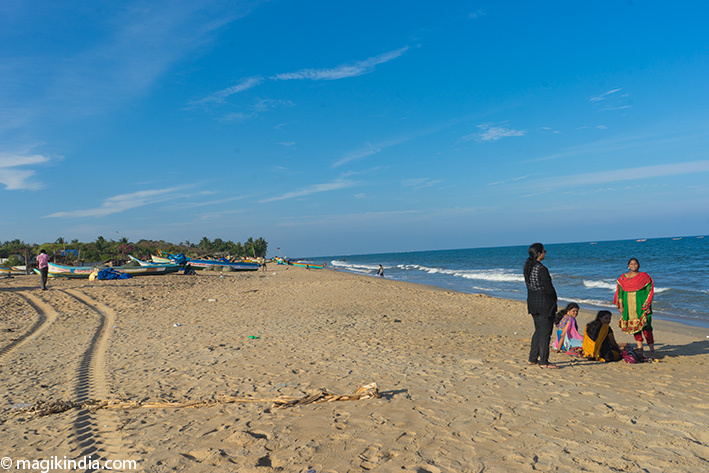 Forget the beaches north of Pondy; Paradise Beach is the perfect place for bathing. A short river cruise will take you there. There are restaurants and accommodation on site. Serenity Beach to the north of the town is 20min away by road. The surf here is very popular. Auroville Beach – popularly called Auro Beach – is near Auroville, 12km from the main town of Puducherry. The last time I was there, both beaches were rather dirty and were not inviting for a relaxed dip. Paradise Beach is a far better bet. Auroville, ‘city of dawn’, was built on the initiative of the Mother, Sri Aurobindo’s spiritual companion. It is a centre for research into human unity. The idea was to build a futuristic town where people of good will could live together in peace and harmony, beyond nationalities and beliefs. During Auroville’s inauguration ceremony on 28 February 1968, earth from 124 countries was placed in a lotus-shaped urn and mixed together to symbolise universal unity. Today this urn stands in the middle of an amphitheatre in the Matrimandir gardens. Auroville, about 8km north of Puducherry, was designed by French architect Roger Anger. About 2000 people live there; nearly two-thirds of them come from abroad. The architecture of the buildings is a combination of Indian and traditional and modern Western elements. Residents work in agriculture, administration, trade, handicrafts, alternative technologies, education, health and development. 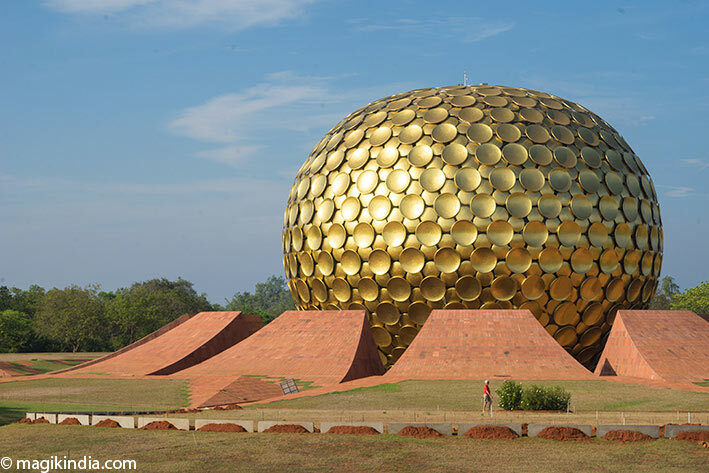 The Matrimandir (‘temple of the Mother’ in Sanskrit) stands at the centre of Auroville and is regarded as its soul. The Matrimandir is not a temple but a vast meditation hall with white marble walls. It houses what is said to be the largest crystal globe in the world (70cm in diameter), lit by the sun’s rays via a system of mirrors on the roof. Around the Matrimandir are twelve smaller meditation halls called the ‘petals’, each with its own ambience. From the outside, the Matrimandir looks like a golden globe forming the centre of a lotus with the petals around it. This vast sphere measures 36m in diameter.